2P START! Live! : Remix Edition | 2P START! In this episode, we mix things up a bit, adding a new segment, removing one (temporarily), and bringing back an oldie. Check out our podcast 2.0! Feel free to let us know what you think of the changes! Hey guys, what’s the second certificate on Dr. Mario’s wall? And why is it that I can never see any of the links that Ray “puts up” on the podcast? “My black Doom award goes to brawl for putting [**BZZT**] in the game.” 🙂 Love that. And that’s a lot of email, Tim. Did you get 10 copies of every email or something? It’s not physically possible to receive 99 emails per day! Finally, what do you expect from Microsoft, Tim? Have you seen Windows recently? I HATE WINDOWS VISTA!! Although, I must admit that they organized the fine structure better (“Users” instead of “Documents and Settings”), they still got rid of many features that we were used to (We being programmers and not normal users). Well since you’re putting the normal trivia for you on hiatus, perhaps at the end of trivia for two you could have a trivia question for us to answer. That’d be cool. Mostly because I want to win more contests. : P I am really happy to see Trivia for Two again though. I do like the Remix section, because I love video game remixes. You do have all the video game music in the world at your fingertips. It’s called the “internet”. I’m not sure if you’ve heard of this concept before, as it’s pretty recent, but I hear it’s really useful. It connects people around the world and such. I’m not convinced about it, but apparently it’s really awesome, or “leet” as some call it. OCRemix is win. I’ve been going there for a couple of years now. People favor the one without the nubby elbows, thus more fan mail for him. Sorry, Ray, but it seems to be the truth. 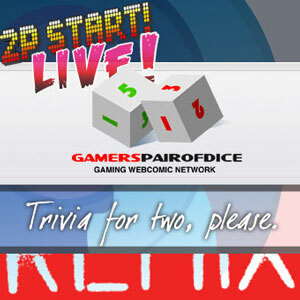 Gamer’s Pair of Dice is how I found out about some of the other gaming web comics I still read. Yes, it’s true, there is another one in my life. I read 14 web comics as of today, including you guys. You’re not changing living rooms every week, are you? It’ll be fine if you copy/pasta the couch. **Metal_Link is not actually metallic. Or linkish. I don’t have a dragon. But they’re real. I know it and I will find one one day and make it be my pet and use it to fly to Japan. Btw, that whole dragonblader1 joke is getting old. I really like that Tecmo Bowl song, nice…..And Trivia for Two is always welcome. *wicka* *wicka* REEEMIIIIX!?!?!? Nice little remix, not a download though. Yeah me too. What’s the dealio guys? 46,000! What can we say, It’s gotta be the hat. No it’s not. Just like blaming me and Rioluke, it’s set in stone forever…..Heh heh, no dragons. GO RAY! DO YOUR BEST! DONT DO A TWEWY COMIC! AND NO DRAGONS! 😀 ! I didn’t consider the poster an egg either, same office, same poster. I was like “Mario Kart a-freaking-gain! ?”, and I hate IGN sometimes. That was sooooo stupid too. And Ray sounded like he was in denial for a second “NO! IT CAN’T BE! ?” heh, Vegeta, *gasp* DBZ comes out today! And fun Megaman fact, Zero was initially supposed to be Megaman X, but because of his large physical differences they chose to go with a remodeled Megaman(X) in order to not alienate old fans with a completely new character. Or something like that. Ray, we know you want the score tracking. But, as you have no doubt determined at this point, most of the games have max scores that are relatively easy. Once you can get 9 seconds on the ultimate balance test, there’s nowhere to go but down. Dude, my friend “Legend Of Zelda: A Link to the Past, for SNES” doesn’t have that game. why did this podcast just end? Where was the banter? Pretty happy with the new segments I must say. Also was happy that I got mentioned, even if it was just briefly (and yes, Tacos are my favorite food). Keep up the good work on these. If you’re listening to the MP3 version of the podcast, then you are unable to take part in this. If you are listening to the M4A version of the podcast which shows different images throughout the show (highly recommended), then you should be able to use this feature. If you’re listening to the show in iTunes, have the “now playing” window on the bottom left open, and when I say you can “click the link,” there will be text on the bottom of the picture. Click on that text, and you’ll be taken to that spot. The same is possible if you’re watching the podcast using the large “click to play” window at the top of this post. “Shadow the hedgehog wasn’t and was never supposed to be Sega’s original mascot. He was created especially for a new rival for sonic. This Legendary Noob fixed it the day you posted this. Coincidence? I think not. Legendary Noob must watch your stuff. On another note, I use the M4A version and I can see these links. But I can’t click on them. I tested this out myself on the “click to play” window above, and although my cursor did not change to the “hand” icon normally seen when a link is clickable, clicking on it regardless still sent me to the webpage programmed. I’m not sure why it wouldn’t be working for some. Maybe if you could tell me where you’re listening to the M4A version, what browser you’re using, and what OS you’re using, I might be able to investigate this a little further. Wasn’t Metal Sonic’s transformation in Sonic Heroes called Metal Overlord? Wasn’t Metal Sonic’s transformation in Sonic Heroes called Metal Overlord?Great podcast, guys! METAL MADNESS! You know, they have a Zone called Metallic Madness in Sonic CD, I’m sure it’s some sort of homage considering that’s the first stage that you race against Metal Sonic(I think). Thanks steve-ohs, I’m ashamed of myself. When Ray included world 5 in there, that sounded right because there IS a warp to world 5 in 4-2, but that’s after the first warp to 6, 7, 8. No excuses though, I should have known that! We’re BOTH wrong! um off topic but i can’t get the “email ray” thing for my brawl code its 1719-4357-0707 i’d appreciate getting on the list….. I’m lonely…..
Izacc, you’re now on the list. T&R, in response to the Joystiq comment…some people are just dead inside, you know? Also, following Izacc’s example, could you put me on the Brawl list as well? My code’s 3866-7756-3894….Dank’a! This is off topic, whatever. Who cares? Just wondering who else has heard the most awesome song ever? Just wondering. This has been in my You-Tube favorites for months btw. It is an awesome song, but the animation that goes with it has been on Newgrounds for a few years now, so I’m pretty sure most of the people here know of it. Yo Dragonblader, just wondering, how come you don’t have an avatar picture? You’re a regular here, so what’s up? Actually, I ended up making an account at that one place to get a pic when I made my first comment but I just haven’t felt like putting a pic there… I’ll have to do that later. Yes! You need that pic of a dragon with Neku’s haedphones .